This exhibition commemorates the centenary of the armistice of November 11, 1918, which saw the end of a war which profoundly marked the bodies, minds, and spirits of those who experienced it, both in and out of uniform. 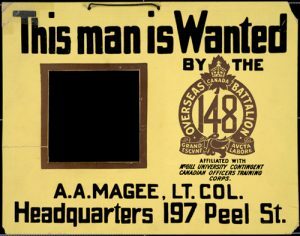 The First World War was a seismic event in Canadian history. The sense of adventure, patriotic pride and comic derision for the enemy seen at the beginning of the war was replaced by a much more somber mood as the reality of warfare on an industrial scale left its physical and emotional marks on the nation. Out of the war came remembrance –attempts to enshrine the memory of those who fought, and especially those who died, in concrete ways. The red poppy made famous by McCrae’s poem was adopted as a universal symbol of remembrance that continues to this day. 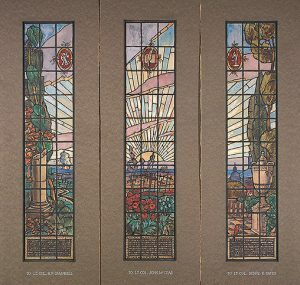 The University created memorials to its fallen, such as the stained glass windows in the Strathcona Building and the Blackader Library. The final case holds the McGill Book of Remembrance, which in biblical fashion records the names of those who died in uniform. Exhibit accessible in the Rare Books and Special Collections & Archives reading room until December 6th during opening hours Monday to Friday from 10am to 6pm. 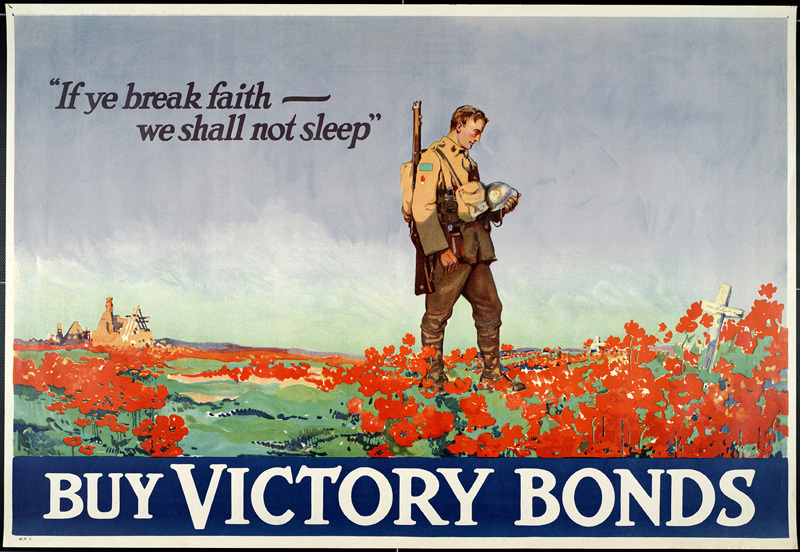 WWI victory bonds poster designed by Frank Lucien Nicolet. RBSC Canadian War Poster Collection, WP1.B1.F1.